For this basketball birthday cake, I used four cakes; two 10x3" round pan and another two 9x3"round pan. It is a are vanilla sour cream pound cakes. 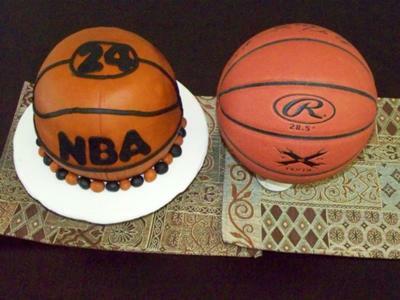 My husband carved the cakes into a ball shape, we used a real basketball for guidance. I covered the cake with buttercream and smooth it. We colored the fondant using brown and orange colors, rolled it out and covered the cake. We use black color fondant for the stripes and the NBA letters and the 24 number. with the remaining fondant, we added small black and brown color balls to cover the bottom border, the board was covered with white fondant. Mildred thanks so much for the Basketball cake for my son. It was a hit at the party and everyone, especially, him loved it. It also tast great and looked FABULOUS!!!! 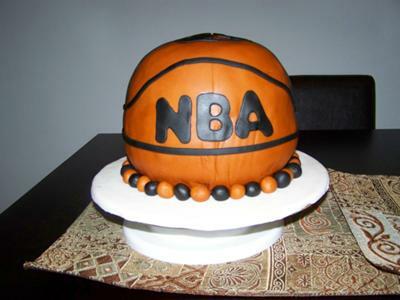 You did a great job making this cake look exactly like the basketball. Keep up the good work. Good Job on the cake!!! looks nice.